New York: Ecco, 1990. Fine/Fine. First edition. Fine in a fine dustwrapper with slightest rubbing. Inscribed by the author to Herb Yellin, who published several limited editions by Oates at his Lord John Press. 1991-07-01. New. Ships with Tracking Number! INTERNATIONAL WORLDWIDE Shipping available. Buy with confidence, excellent customer service! 1990-01-09. New. Ships with Tracking Number! INTERNATIONAL WORLDWIDE Shipping available. Buy with confidence, excellent customer service! Ontario Review Press, 2002-09-01. Paperback. Used:Good. New York: THE ECCO PRESS, 1990. First Edition. 8vo. Orange cloth and boards. Fine in fine unclipped pictorial dustjacket. First Edition. 8vo. Signed "Joyce Carol Oates 10 April 1995" on title-page. Ontario Review Pr. PAPERBACK. 0865381089 New Condition. . New. Ecco Pr. Hardcover. 0880012609 New Condition. . New. Plume. PAPERBACK. 0452267080 New Condition. . New. New York: Ecco Press. 1990. First Edition; First Printing. Hardcover. 0880012609 . Near Fine in a Very Good dust jacket. Upward creasing to upper and lower edges of front and rear panels. ; 8.40 X 5.70 X 0.70 inches; 98 pages; Original unclipped dust jacket protected by archival Brodart cover. All domestic orders shipped protected in a Box. .
1991-07-01. Good. Ships with Tracking Number! INTERNATIONAL WORLDWIDE Shipping available. May not contain Access Codes or Supplements. May be ex-library. Shipping & Handling by region. Buy with confidence, excellent customer service! 1990-01-09. Good. Ships with Tracking Number! INTERNATIONAL WORLDWIDE Shipping available. May not contain Access Codes or Supplements. May be ex-library. Shipping & Handling by region. Buy with confidence, excellent customer service! New York: Ecco Press. 1990. First Edition; First Printing. Hardcover. Very Good+ in a Very Good+ dust jacket. ; 8vo 8" - 9" tall; Original unclipped dust jacket protected by archival Brodart cover. All domestic orders shipped protected in a Box. .
Hopewell, NJ: The Ecco Press, 1990. First edition. Softcover. Uncorrected proof. 86 pages. A very near fine copy in blue printed wrappers. Uncommon. New York: The Ecco Press, 1990. First edition. Hardcover. First printing. A short novel from this prolific writer. A fine copy in a fine dust jacket. Signed by Oates in full on the title page. Ecco Pr. Hardcover. 0880012609 Like New Condition. . Fine. Ontario Review Pr. PAPERBACK. 0865381089 Like New Condition. . Fine. Plume. PAPERBACK. 0452267080 Like New Condition. . Fine. New York: Ecco Press. Good in Very Good dust jacket. 1990. First Edition; First Printing. Hardcover. 0880012609 . A nice first edition/first printing in Good condition in Very Good dust-jacket. Discolored sticky areas on front and read endpapers and dustjacket. Cocked spine. Clean unread copy; . New York: Ecco Press. Near Fine in Near Fine dust jacket. 1990. First Edition; First Printing. Hardcover. 0880012609 . Ships same or next business day. Slight rubbing along tail edge; otherwise, appears unread and free from defect. ; 0.7 x 8.4 x 5.7 Inches; 98 pages . New York: Ecco, 1990. 10/24/2009. Fine/Fine. First edition. Fine in a fine dustwrapper. New York: The Ecco Press, 1990. A superb copy in a Mylar dj cover.. First Edition. Cloth. As New/As New. Octavo. No Exit Press, 1998. First English Edition. Near Fine book in a Near Fine dust jacket. The Ecco Press, 1990. First Edition. Hard Cover. Near Fine/Near Fine. Signed by author. First edition. Signed by author without inscription on title page. 1990 Hard Cover. We have more books available by this author!. 98 pp. 8vo. A novella by the National Book Award winner and Pulitzer Prize nominee. New York, New York, U.S.A.: Ecco Pr. Hardcover. 0880012609 This hardcover book is square and tight. The boards, endpages, spine, and gilt/lettering are all pristine. The pages are clean, having no markings or folds. The dustjacket is bright and AS NEW. Original price intact. Brodart protected. No remainder mark. Not ex-lib. Not book club. This copy was obtained from a nationally known auction house. . Fine. 1990. First Edition. NY: Ecco Press, 1990. - 98 page novella - signed on title page - fine in fine dj .. Signed by Author. First Edition. Cloth. Fine/Fine. 8vo - over 7¾" - 9¾" tall. New York: Ecco, 1990. 1st. Hardcover. Fine/fine. NY: Ecco Press, 1990. First Edition. 8vo, pp. 98. Slightly scuffed at ends of spine, o/w a nice copy in little scuffed dj. A short novel. NEW YORK: ECCO PRESS, 1990. THIS IS A BEAUTLIFUL LIKE NEW HARDBOUND FIRST EDITION IN DUST JACKET OF THIS MARVELOUS BOOK BY JOYCE CAROL OATES...I LOCK MY DOOR UPON MYSELF....THIS COPY HAS BEEN SIGNED BY JOYCE CAROL OATES AND IS A REAL TREASURE FOR SUCH A LOW P;RICE.. Signed by JOYCE CAROL OATES. First Edition. HardBOUND. LIKE NEW/LIKE NEW. OCTAVO. NOVEL. NY: Ecco Press. (1990). Very Good in Very Good DJ. First Edition. Hardcover. Very Good. Ecco. Fine in Fine dust jacket. 1990. First Edition; First Printing. Hard Cover. 0880012609 . SIGNED and inscribed on the half title page by Joyce Carol Oates. ; Tight, clean and crisp. In excellent condition with dustjacket protected in a new Mylar cover. No remainder mark. Not price clipped. Not ex-library. As New. ; 8.40 X 5.70 X 0.70 inches; 98 pages; Signed by Author . NEW YORK: THE ECCO PRESS, 1990. JOYCE CAROL OATES HAS LONG BEEN RECOGNIZED AS ONE OF THE WORLD'S TRULY GREAT WRITERS...MENTIONED QUITE OFTEN FOR THE NOBEL PRIZE SHE IS CONSIDERED IN THE LEAGUE WITH CARSON MCCULLER, FLANNERY O'CONNER, EUDORA WELTY, PHILIP ROTH, FAULKNER, HEMINGWAY AND SEVERAL OTHERS...NICE SIGNED FIRST EDITIONS OF HER BOOKS ARE RISING IN PRICE AND DESIRABILITY CONSTANTLY...THIS IS A VERY NICE FIRST EDITION OF HER EARLY AND SCARCE TITLE,I LOCK MY DOOR UPON MYSELF...SIGNED JOYCE CAROL OATES.. Signed by JOYCE CAROL OATES. FIRST TRADE EDITION. HardBOUND. Fine/Fine. OCTAVO. New York: The Ecco Press, 1990. 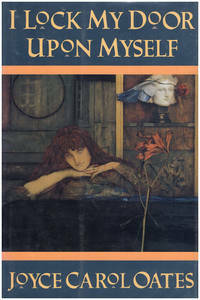 Oates' story is the first of what The Ecco Press planned as a series of imaginative collaborations between authors and works of art; in this case between Oates and the 1891 painting by Fernand Khnopff with the same title as the story and which serves as cover art on the dustjacket. The story chronicles the life of an upstate New York woman, born Edith Margaret Freilicht in 1890 and known as Calla in the small town where she lives. A beautiful, eccentric individual who is a puzzle to her husband and children and whose life becomes defined by her association with an itinerant black water diviner and the community's superstitious racism. Boards and text are clean, tight, square; dustjacket shows only the slightest surface and edgewear. Collectable. . First Edition, First Printing. Hard Cover. Fine/Fine. New York, NY, U.S.A.: HarperTrade, 1990. Book. Fine. Hardcover. First Edition. 8vo - over 7¾" - 9¾" tall. A pristine copy of this book in a dj that has a crease along front flap, otherwise fine..
Ecco Pr, 1990-11-01. Hardcover. Used:Good. New York: The Ecco Press. Near Fine in Near Fine dust jacket. 1990. Hardcover. Richard Ford says: "For whatever else this little book may be--fiction on art, or an artfully composed shadowbox of narrative within narrative--it is first a slingular and affectling story." Near Fine/Near Fine. Ships same or next business day. ; 8vo 8" - 9" tall; 98 pages . New York: Ecco, 1990. Fine/Fine. First edition. Fine in a fine dustwrapper. New York: Ecco Press. 1990. First Edition; First Printing. Hardcover. 0880012609 . Very Good in a Very Good dust jacket. Owner name to FEP. Crease to rear panel. ; 0.7 x 8.4 x 5.7 Inches; 98 pages; On Sale! . I Lock My Door Upon Myself [A Novella]. Belfast: Blackstaff Press, 1992. . First British Edition. 8vo. 98pp. Printed wrappers. Near fine. No British hardbound edition. . Edition: First British Edition. 8vo. 98pp. Printed wrappers. Near fine. I Lock My Door Upon Myself. NY: Plume., (1991).. First trade paperback edition.. 98 pp. Fine in glossy illustrated wrappers. Photocopied letter from a Plume editor to Oates laid in, detailing the sending of comp copies, and noting that the first printing of this edition was 20,000 copies. Ecco, 1990. 1st US edition.. Hardcover. NF. Ink to endp/NF.. Cloth spine. Ecco, 1990. Hardcover. Very Good/very good. Unmarked text. Unclipped dust jacket under clear protective cover. 98p. This compact yet powerful novel is perfect for anyone wishing to step into the hypnotic fictional world of Joyce Carol Oates. Ecco Press, 1990. Book. New. Hardcover. N/N dj R.170.